Andrew S. Pak is currently Vice President, Corporate Counsel, Cybersecurity and Privacy, for Prudential. Andrew advises on regulatory matters affecting cybersecurity and privacy and manages cyber incident response, privacy incident response, and internal investigations, handled by the company’s High Technology Investigations Unit. Prior to joining Prudential in September 2018, Andrew spent over 7 years as a federal prosecutor. 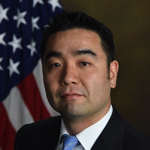 From 2016 through 2018, Andrew was Senior Counsel in the Computer Crimes and Intellectual Property Section (“CCIPS”) of the Department of Justice in Washington D.C., where he handled cybercrime prosecutions, trained and advised federal prosecutors around the country on issues related to cybercrime and the collection of electronic evidence, and engaged on policy issues relating to cybercrime and cybersecurity. As a CCIPS attorney, Andrew also successfully litigated against major email providers across the country regarding their disclosure obligations under the Stored Communications Act. From 2011 through 2016, Andrew was an AUSA in the U.S. Attorney’s Office for the District of New Jersey and was the office’s Cybercrime Coordinator. As an AUSA, Andrew prosecuted the largest computer hacking and securities fraud scheme ever charged, US v. Ivan Turchynov et al. and U.S. v. Iermolovych, where a team of hackers stole press releases from major newswire companies, prior to their public distribution, which they then sold to securities traders who used the stolen information to generate millions in illegal trading profits. Andrew also prosecuted the largest credit card hacking case charged to date, US v. Vladimir Drinkman et al., relating to hacks into 7-Eleven, JC Penney, Heartland Payment Systems, Hannaford Brothers, Visa, Jet Blue, and others. Links to materials available here. Copyright © 2019 Incident Response Forum 2019.